What a special Friday evening -- I had the pleasure of hosting a private cooking class for a mother and her four daughters. And small world, because they went to high school with my husband! On the menu ~ Cheesy Artichoke Squares, Spring Vegetable and Goat Cheese Tart, Herb Roasted Chicken, and Chocolate Croissant Bread Pudding. First, I wanted to have something yummy to snack on while we started cooking. I prepared the Cheesy Artichoke Squares recipe in advance and shared my trick for fresh breadcrumbs. 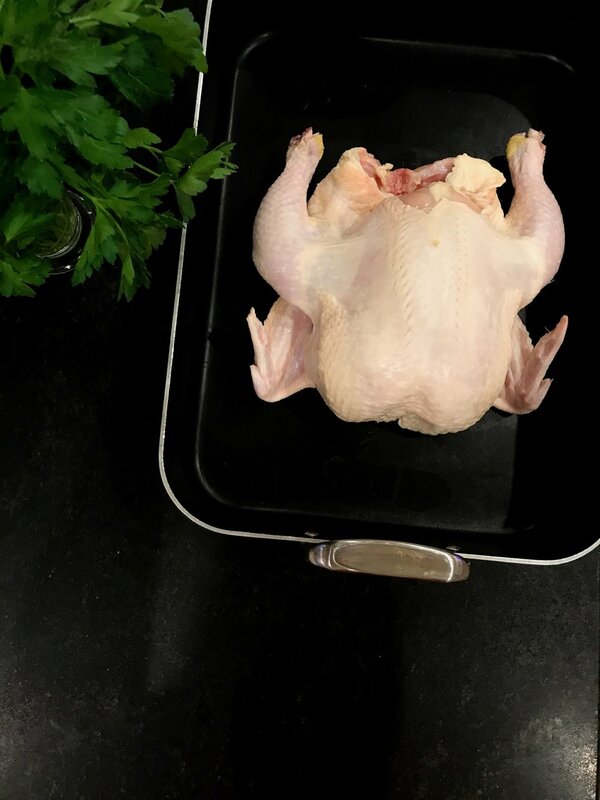 Because the chicken takes a little while to roast in the oven, we started with that. 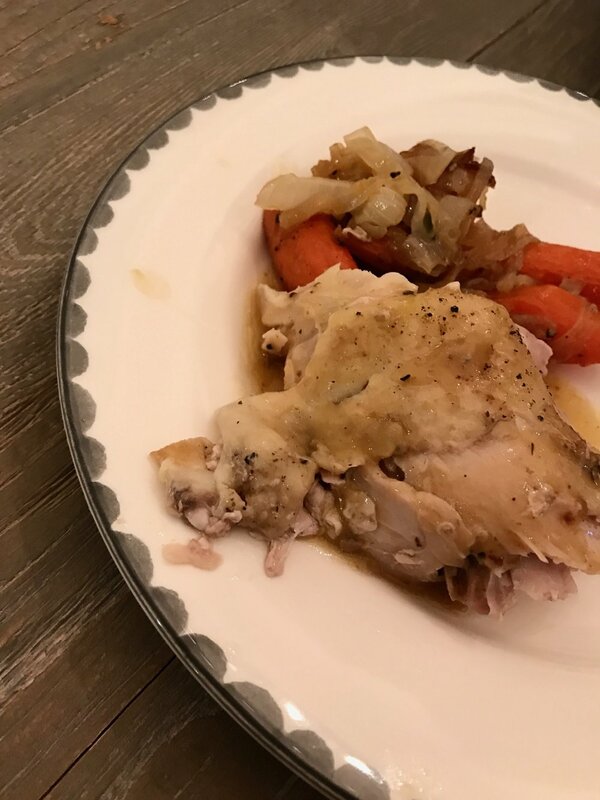 I think everyone needs a good roast chicken recipe on hand for entertaining. This recipe is my go-to because it is so versatile for leftovers. Herbs, lemons, and simple seasonings are all you need! After we got a handle on the chicken, we whipped up the Spring Vegetable and Goat Cheese Tart. I use a combination of roasted and sautéed green veggies. It comes out so light and fluffy. Next up -- Chocolate Croissant Bread Pudding. Bittersweet chocolate is heavenly with the sweet croissants. We created a custard for this recipe, let the croissants soak it up, and then baked away. There is nothing better than the smell of a chicken roasting! After it finished cooking, I tented it, and made a simple pan gravy. 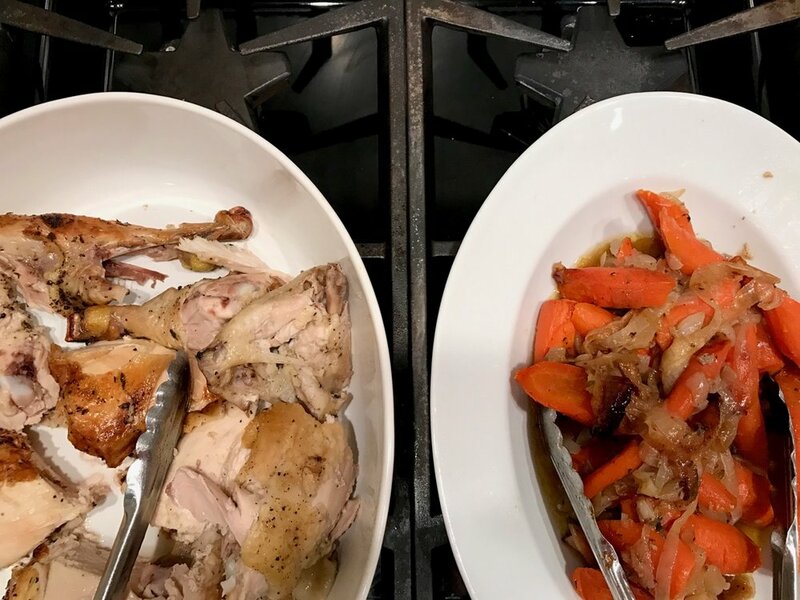 I don't know what's better -- the chicken or those delicious veggies that soak up all the goodness from the roasting pan.